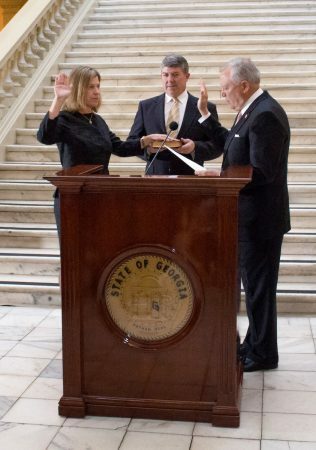 Ashley Wright ’89 was sworn in as a superior court judge for Augusta (Georgia) Judicial Circuit Court in January. 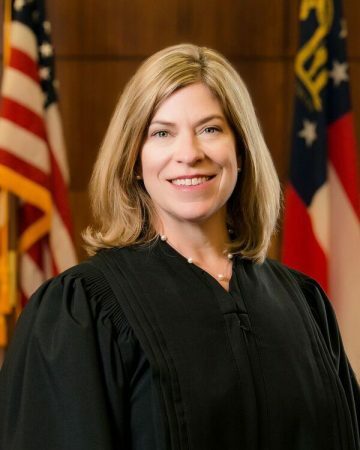 For about 20 years, Ashley Wright ’89 spent most of her time facing the judge’s bench as part of her role as assistant district attorney and then district attorney for Augusta, Georgia. These days, however, she has a different view of the courtroom—now from the bench. Wright was appointed as a superior court judge for the Augusta Judicial Circuit Court in January and primarily handles divorce, support, custody, and other domestic cases. The new role was a natural step for Wright, who became district attorney in 2008 and oversaw cases involving crimes against children, sexual assaults, and violent felonies. While Wright is transitioning into the new role, Georgia’s courts system is going through some changes of its own. The state is working to improve court accessibility and has recently allowed citizens to appear in court pro se—on their own behalf and without an attorney—helping them save money on attorney fees. One of the biggest challenges of being a judge, Wright said, is the view into so many people’s lives and struggles. “Both as a DA and as a judge, I have seen the long-term challenges that so many families face, and it can be heart-breaking,” she said. Though a career in the courtroom is the only one Wright can imagine now, there was a time when her life could have turned out completely differently. She was an English major, but credits her college experience for helping her learn to be adaptable and open to new opportunities and ideas.